Even after countless trips to Sandy Hook, I'm still finding new reasons to love the place. After visiting the snowy owl a few weeks ago, Ivan and I wandered the area near the Marine Academy of Science and Technology (MAST) and found something quite different: a set of American holly trees larger than any either of us had ever seen. I'd long heard that the Hook is home to the largest holly forest on the East Coast, but I'd yet to see any of the actual trees, fully laden with berries. Here some were, standing innocently next to buildings. What of the forest? Sandy Hook's MAST campus is likely well over 100 years old. To find that, you likely need to go on a guided tour with a National Park Service ranger. Sandy Hook's holly forest includes several trees estimated to be more than 200 years old and 70 feet high, and is, perhaps, the country's largest stand of virgin holly forest. Its caretakers want to keep it that way, carrying on a tradition that once went as far as to include armed guards. Yup, you read that right. The forest has a somewhat unlikely benefactor to thank for being preserved at all: the United States Army. The Hook's military history stretches back to the Revolution, when American forces raided the lighthouse to take the whale oil needed to light the then British-controlled beacon. And as speculators built entire seaside resorts along the length of the Jersey Shore, the establishment of the Sandy Hook Proving Ground and later Fort Hancock in the late 19th century cemented the peninsula's "off limits" status for developers. As a result, the trees, along with the other local plants, were free to thrive as their counterparts to the south were replaced with beach houses and boardwalks. birds, including cedar waxwings, cardinals and mockingbirds. 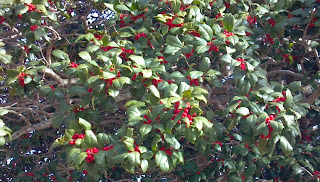 The New Jersey shoreline is an ideal place for holly, as it turns out. Native to sandy soil, its glossy leaves resist the corrosive saltwater spray that would decimate less hardy leaves. Still, ocean frontage takes its toll. While holly is normally slow to mature, many of the Sandy Hook trees grow only about an inch every ten years, their unsheltered boughs stunted by the force of wind and unrelenting sea spray. While the Sandy Hook forest has enjoyed a reprieve from development, it hasn't gone entirely unmolested. 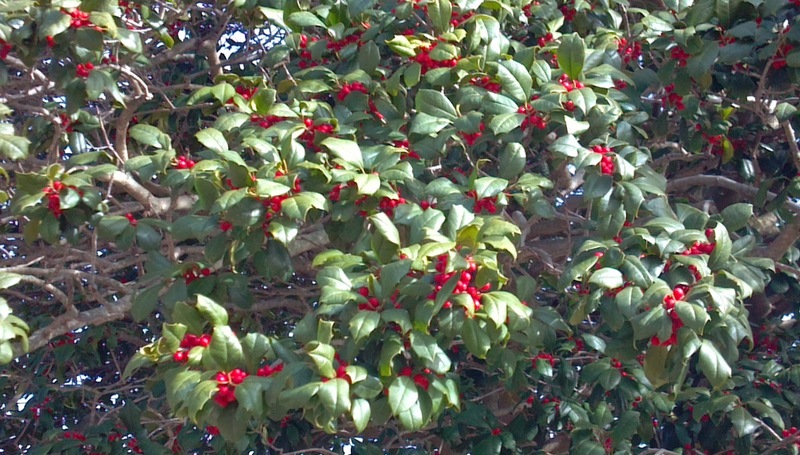 By past tradition, area residents would sneak onto the Hook to grab a few sprigs of holly to decorate their homes during the winter holidays, prompting the Army to station armed guards to protect the trees. You have to question the motives of the fort's leadership on that one: officers' wives usually didn't have much trouble securing local holly to add to their own Christmas displays, and requests from dignitaries were reportedly filled. Rank has its privileges. 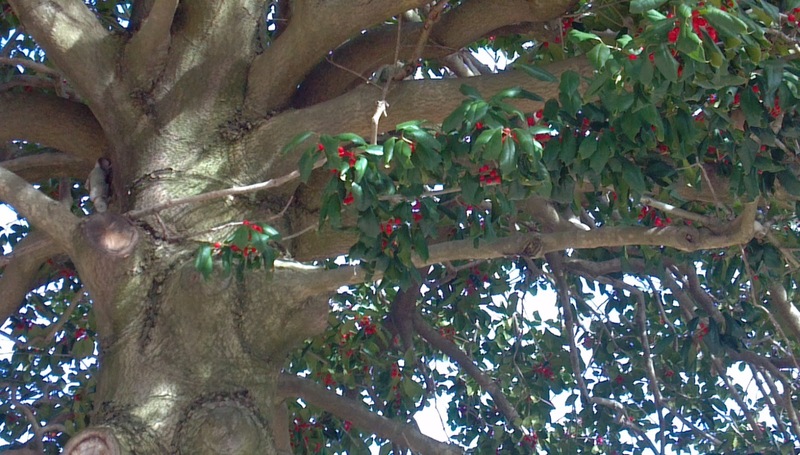 Sandy Hook may be home to the largest natural occurrence of holly in the state, but other New Jersey communities rank in the annals of Ilex opaca, too. 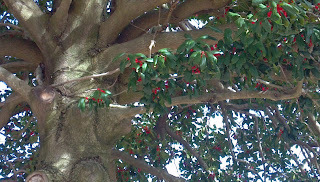 Rutgers Gardens in New Brunswick contains one of the nation's biggest collections of bred hollies, while Millville in Cumberland County became known as the Holly City after the New Jersey Silica Sand company planted a 50 acre, 2800-tree orchard there in the 1920s. I haven't visited the Millville property yet, but if my research is any indication, that installation may have fallen victim to a real estate development called -- wait for it -- the Holly Orchard Estates.